For me, this has been one of those recordings that I knew almost from the beginning would be an extraordinary aural experience. 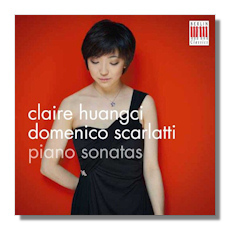 As I listened to the G major Sonata, K. 13, which leads off the first disc, I was stunned by young Claire Huangci's finesse: she plays Scarlatti with subtlety and clean, all-encompassing technique that allows her to do virtually anything with the music she desires. Huangci (b. 1990) possesses a tonal leanness, a seemingly perfect digital clarity and evenness, and interpretive acumen that captures the essence of just about every work on this two-disc set. The K. 13 sonata effervesces so delightfully in its chipper, almost ecstatically joyful character. I later made comparison with three other recordings of this sonata: Ivo Pogorelich on DG, Eteri Andjaparidze on Naxos, and Alicia De Larrocha on Decca. The Pogorelich, which was made before the pianist's unfortunate decline, was good but didn't have the energy and luster of Huangci's effort. The Andjaparidze version was very meaty and aggressive, played in a way many would not favor in Scarlatti, though I liked it for its individuality, but not as nearly much as Huangci's more graceful and elegant account. De Larrocha was the best of the three, but I would still give the edge to Huangci. As I continued listening to Huangci's performances, I noticed that the next several sonatas on the first disc were also in G major. This was not a coincidence: for the first disc Huangci assembled sonatas into suites, ordering them by key and to form a dance sequence. As she explains in the album notes, "the first CD follows basic form with an opening movement (prelude or toccata) then allemande, courante, sarabande, gigue with additional intermezzo movements such as bourrées, passepieds, gavottes, minuets, etc." The second disc features shorter suites, which are put together based on more abstract criteria. Suffice it to say that the works in each set form a sort of sonata and are not necessarily in the same key, but share certain likenesses and convey, as Huangci puts it, "a narrative, like the sonatas of Haydn, Mozart and Beethoven." Thus, for once a pianist has assembled a collection of Scarlatti sonatas based on meaningful, if slightly esoteric criteria. In a sense, she makes each sonata a component of a larger work, a work whose architecture is grander and deeper. That said, I would have been satisfied with a varied selection of her favorites, as her artistry throughout both discs is consistently impressive. She's especially convincing in the livelier and faster sonatas, like the aforementioned K. 13, the playful and brilliant K. 454, and the Spanish-tinged K. 284, all G major pieces. In the G minor works Huangci imparts an utterly infectious verve and bounce to K. 450, and she captures the elegant busyness of K. 35 and the earthy and humorous character of K. 108. She also plays the slower and often profound sonatas just as convincingly: try her deftly forlorn account of the G major K. 144 or the very sad and beautifully phrased rendition of the D minor, K. 32. All this, and I haven't even mentioned the second disc yet. There you'll find the same kind of artistry. Highlights include Huangci's ebullient account of the A major, K. 322; her hypnotic and graceful take on the D minor, K. 213; her hardy yet playful rendition of the A minor, K. 61; and her scampering and breathless version of the D major, K. 29. It would be difficult to find much of anything that goes wrong on either disc: perhaps she's a bit mechanical in the G minor Sonata, K. 8, or a little stiff in the G minor K. deest, but even in these works she is still effective in conveying the darker character of the music. Berlin Classics provides vivid and well balanced sound reproduction to round out this superior collection of Scarlatti sonatas. I can only say that having watched much of the 2013 Cliburn Competition as it was streamed on the web, I still find it hard to believe that Claire Huangci didn't make the final round. I have to wonder at the decisions of so many of these major competition juries. I had picked Huangci as my favorite to win. Instead, the jury picked six other finalists, at least two of whom were questionable choices. Sara Daneshpour was perhaps another pianist whose talents were ultimately overlooked in that competition. At any rate, this is Huangci's second recording for Berlin Classics – her first featured transcriptions of ballet music by Tchaikovsky and Prokofiev, which received broad critical acclaim. Perhaps, with the success of this second recording, Huangci will be accorded the praise and attention she rightly deserves. Highly recommended.